The tour around the company Sächsische Walzengravur at the start of the Innovation Day provided an insight into the latest printing and embossing forme production using state-of-the-art direct laser technology. The Janoschka Academy has continued its highly successful series of Innovation Day events. 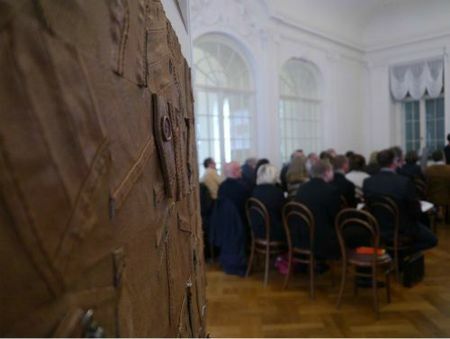 The third Innovation Day “Tactile effects are decisive” took place on 19 and 20 September 2013 in Saxony. Following hugely successful events for the tobacco and security market, the third Innovation Day was dedicated to tactile and semi-tactile surfaces and 3D structures, a very exciting subject not only for the decor market, but also for the packaging sector. The audience were particularly fascinated by the examples of semi-tactile surfaces, which give the impression of depth without being tactile, and their potential future applications in the decor and packaging market. The system developed by Sächsische Walzengravur for producing tactile and semi-tactile structures opens up a completely new product dimension. The system is based on the SWG workflow, hapticCELL, for engraving and embossing. Congruent printing data that gives an impression of depth are combined with high-definition 3D embossing data to significantly enhance the visual impact of the embossing and at the same time give the printed data a more vibrant appearance through the embossing. The core of the workflow is the “Topogetter 700” scanning system and the “6to5” software of technology partner Dr. Wirth. Dr. Lutz Engisch, director of the iP3 institute and Janoschka’s Chief Innovation Officer, will be happy to provide you further information.